The Mobile Interactive Map can be viewed and used in desktop web browsers. 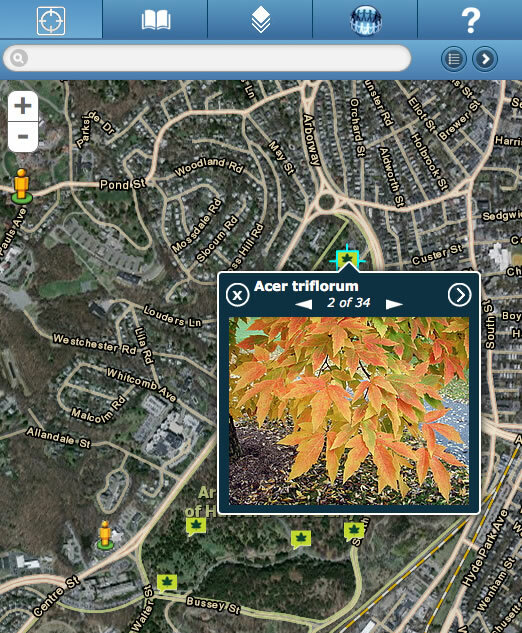 Using a new mobile mapping application developed with ArcGIS, visitors to The Arnold Arboretum of Harvard University can stroll through the lush garden with their smartphones and locate and learn more about the arboretum’s unique botanical collection. By tapping icons on the smartphone screen, they can find trees and plants, such as a full-moon maple in North Woods, the witch hazel near Hemlock Hill, and the Japanese beautyberry in Leventritt Shrub and Vine Garden. The arboretum launched its Mobile Interactive Map(MIM) in May 2012, making it easier for everyone from scientists to visitors to explore its collections in person or virtually. Designed to educate visitors and assist in research, the application provides detailed information on botanical species, including their natural history and taxonomic placement, using a simple map-based interface. Since its founding in 1872, the 265-acre Arnold Arboretum in Boston, Massachusetts, has grown botanical species from all over the world to conserve and study. Today, the arboretum cultivates more than 2,000 species, representing some 15,000 individual trees, shrubs, and vines. Arnold Arboretum’s value lies not only in the diversity of its plants but also in the scientific research they support and inspire. The arboretum has earned a reputation for rigorous record keeping that painstakingly tracks the life of each accessioned plant from its beginning to its eventual end. “Every individual plant in our collection has a special story,” says Michael Dosmann, curator of living collections. “Our curatorial work focuses on preserving and sharing those stories as well as keeping tabs on all of our plants spatially and over time.” Many species are native to other countries, including Russia, China, and Germany, and have been bred, cultivated, and studied for centuries. The person icon denotes the position of visitors using GPS tracking. The application provides many details about each plant. In MIM, about 15,000 dots—each representing a plant—populate a basemap of the arboretum grounds. Tapping one of those dots activates a pop-up window that contains more detailed information on that specific plant—its age and condition, where the arboretum acquired it, its latitude and longitude in the arboretum, and other information. In addition to providing a bird’s-eye view of the botanic and geographic diversity of the collections, MIM is a mashup of data inputs from other sources, including JSTOR, Flickr, and Google Images. MIM also links to external data maintained by other botanic gardens, the United States Department of Agriculture (USDA), and additional organizations. Each plant is grouped by color according to its family. Users can also perform custom plant searches, quick searches, and spatial queries. 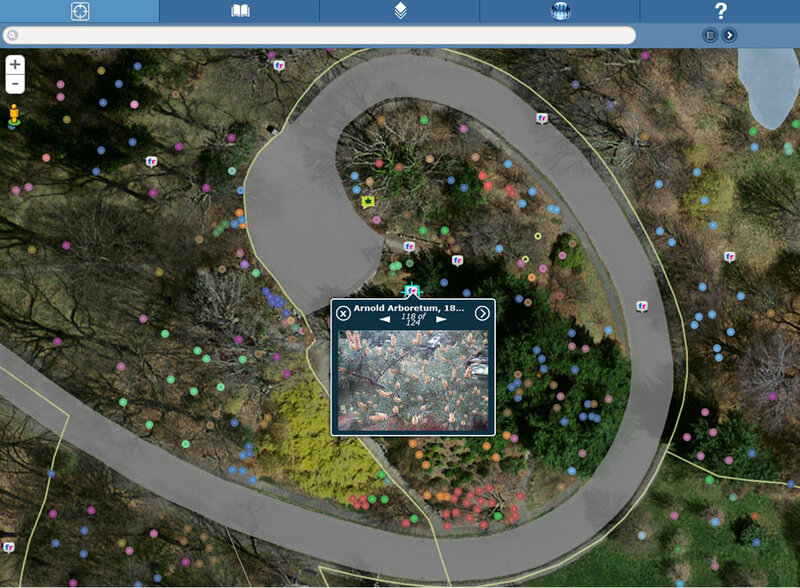 The search function utilizes the onboard GPS functions of the mobile device and can show the distribution of queried plants throughout the grounds. Leaf icons indicate a plant, tree, shrub, or vine that contains an identifying photo from Flickr photo service. 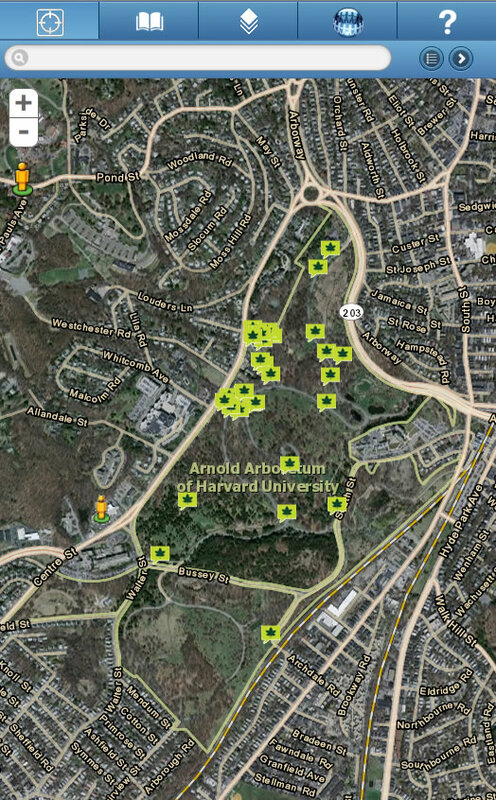 Since the 1980s, Arnold Arboretum’s living collection has been digitally mapped and documented using a combination of various software packages. Curatorial staff currently use a suite of ArcGIS for Desktop and Esri mobile GIS software applications, coupled to a dedicated plant records software package known as BG-BASE. To broaden scientific access to collections data, the arboretum launched a desktop interactive map called Collection Researcher in 2011. Built by arboretum Putnam research fellow Brian Morgan, who collaborated with arboretum IT and curation staff, the Flex-based desktop application served as a kind of prototype for the arboretum’s future mobile application designs. The applications are a key component of Harvard’s broader initiative to expand access to its resources for science and education. For more information, contact Donna Tremonte, applications programmer, Arnold Arboretum of Harvard University.